Ruby Dee, legendary actress, author and activist was honored with a public memorial celebration at the Riverside Church in New York City on Sept. 20. She and her husband Ossie Davis, long-time friends of the veterans of the Lincoln Brigade, were extraordinarily generous and bold, lending their celebrity to a host of leftist causes. 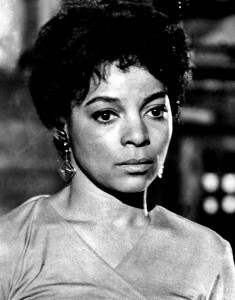 Throughout her life, Ruby Dee refused to play the stereotypical roles of maid or Mammy, which were then the only available roles to black actresses, and chose to play assertive women in mostly progressive films. Actress and civil rights activist Ruby Dee was memorialized Saturday in poetry, dance and song at a packed Harlem cathedral where Alicia Keys sang her song “Superwoman,” Wynton Marsalis performed a stirring trumpet solo, and well-wishes were sent from Sidney Poitier, Harry Belafonte and the White House. Read the obituary in the New York Times here. View photos of the memorial taken by Len and Nancy Tsou here.